Starting off on the road to university can be very costly. You’ll need to find money for everything from course books and accommodation fees to the obligatory trips to Ikea to kit out your new digs. So you might decide that a car is one expense you can do without. But if you do need a set of wheels, there’s a few things to consider to make sure you get the best car for student life. It needs to be economical, safe, have some decent tech inside it (to make long journeys more bearable), and good boot space to help with moving everything to and from home at the start and end of term. You’re already going to have a lot to pay out for, so if you’ve decided you need a car, you’ll need one that’s as cheap to buy and run as possible. Forget about your hot hatch GTi dreams for now, instead, think about getting a car in a low (1 or 2) insurance group. Building up your no claims bonus over the time you’re at university could mean cheaper insurance when you decide you want more power under the bonnet as your start your post-graduation work life. It’s also worth considering an older diesel if your uni is a bit of a trek from home and you’re planning on going back and forth a lot during term. Diesel can be more economical for those motorway road trips. However, if you’re planning on mainly using your car for shorter, urban journeys once you get to uni, petrol is your best bet. Many cities are now considering restrictions or charges on older diesels. You might think trying to run a car on a shoestring at uni is impossible but it can be done. We definitely don’t want to encourage getting into more debt. But if you have a part-time job while studying, you may want to look at finance as a way to get a motor that’ll last you well beyond your university days. Instead of opting for a £500 old banger you’ll be able to get yourself something a lot newer and more reliable. Whereas your budget may only stretch to £1,000, finance over the three or four year uni period means a car of £4,000 could cost as little as £100 a month and a £6,000 car would be around £150 a month. So what can that get you in the real world? A 1.2 litre 2014 Vauxhall Corsa could easily be yours for around the £6,000 price tag, they’re super affordable to run, with low insurance and tax. It might not be as glamorous, but at £4,000 a 2013 1.2 litre Nissan Micra should be a good bet in terms of reliability. Or for the more style-conscious a 2012 1.2 Ford Fiesta can be yours for around the £5,000 mark. Don’t ignore safety even when money is tight. Euro NCAP (New Car Assessment Programme) has been assessing and rating new car safety for 20 years, so whatever your budget its star ratings are a useful guide. Having breakdown cover is also a good idea with an older car, especially if you’re a cash-strapped student. That’s another reason why you should take a look at AA used car listings. All the vehicles for sale come with 12-month basic breakdown cover for free. You want the highest spec tech you can find for your money. It’s those little luxuries that make your life easier. Although most people have maps on their smartphones, a car with built in sat nav means you don’t have to worry about losing signal in remote areas or your phone dropping off its screen attachment at a crucial point in your journey. A USB or AUX input is the bare minimum to keep you and your friends sane on long journeys. Bluetooth handsfree is another plus for keeping in touch on the go and air conditioning or climate control is something else you can look out for. 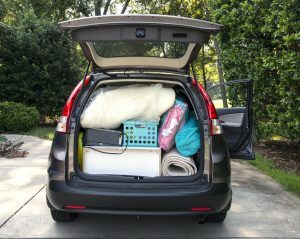 While it might not seem high on the list of priorities, having a decent sized boot can be pretty vital when lugging your life between university and home. Most hatchbacks have average sized boots, just make sure that the rear seats fold down so you can take advantage of the extra space. Make sure whatever you pack is done safely. To check out what you could be driving to uni this autumn take a look at the AA Car Finance page.